Wireworld Island 6 review | What Hi-Fi? 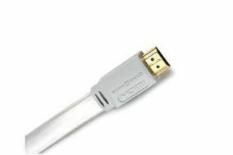 Despite having chunky plugs reminiscent of those from an Eighties printer, this HDMI 1.4-standard Wireworld has a comforting feel. Colour and contrast are perfectly acceptable, with subtle tones and bright scenes reproduced to good effect. Images possess sharp detail and real depth, although we did notice noise at times – and motion wasn't as smooth as we'd like. Sonically it's a success, with strong dynamics and firm punch. It's a shame about the motion issues, as this is a great performer in other respects.